This may be one of those posts. Before I lose you, let me explain. Over the weekend, I had the incredible opportunity to attend a ladies event at my church. It was picture perfect. The message was awesome, the decor was fabulous, down to the last pink and red hearts on the tables. However, the next day, I was not feeling so great. Something was stirring in my spirit and I wasn't quite sure what it was. I chalked it up to not getting enough sleep due to a late night waffle house run with some of the girls from my church. Monday came, and I was still not feeling "right". As I had my quiet time that morning, I looked over at the gift that was given to all of the girls from our women's event. 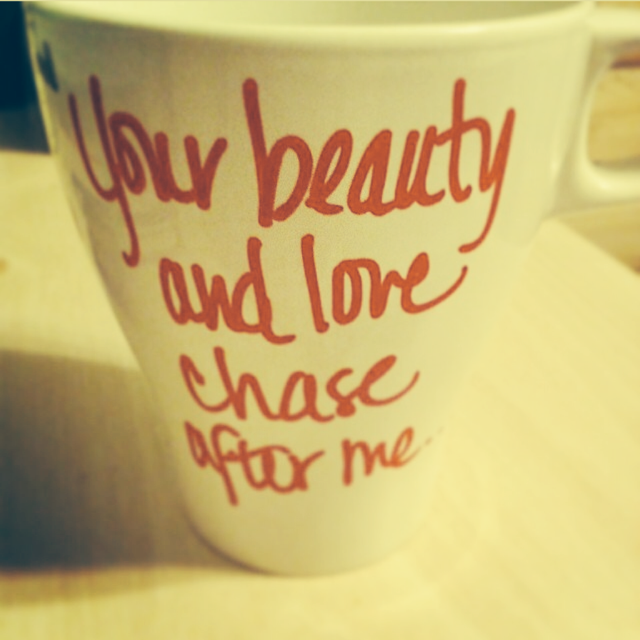 It was an adorable coffee mug with the verse "Your beauty and love chase after me" Psalm 23:6. This verse was the theme for the night. Along with this verse, being "Pursued" by the Lord was the message given by my precious friend, Kelli. When I looked at this cup sitting next to me that morning, it struck me. I pushed the emotions down, and tried to forget about what was stirring in my heart after I read that verse. Those emotions stayed down for a bit....until I was alone in my car that afternoon. I turned down the music and told the Lord out loud that I was about to get real honest with Him about something. My heart started pounding hard in my chest. I mean, could I really talk to the Lord like I was about to talk to Him?? So, I was about to be really bold. Not just bold....but BOLD. Teeth chattering, I slowly started to spill what was on my heart. "Lord, Your Word says that you chase after me all the days of my life. I believe Your Word. But, I have a hard time believing that. I don't feel like you chase me. I feel like I chase You. I feel like I am always pursuing You more than You are pursuing me. I get tired and weary from chasing You." Yeah, I know you're thinking I'm crazy to say that to our Father in Heaven! THE BIG MAN! Our CREATOR! So, after being a little too real with Him, I just sat there. A few minutes passed and I heard nothing in my spirit back from Him. Just quiet. Suddenly, He spoke to me. Not audibly, but in my spirit. "Jill, you can't chase after Someone that is not running from you. I am with You. I Am that I Am. This means I am in the Present with you. "I Am" is present tense. So, when you say you chase Me, you are not chasing Me. You are chasing after something your flesh desires. You are chasing after what you see as My best for you....not what I have for you in the present. You sometimes chase after My blessings, Jill, and not Me. I cannot be chased. I am always with you. I am the One who chases you, because you run from Me.....in all of your chasing of other things...."
Y'all, I was in the car on the freeway when my spirit was rocked with this. I looked around for a pencil and paper to write this down...nothing. So, I grabbed my phone and went to my notes app which has a microphone. I spoke this whole thing into my note pad. I am NOT kidding! I was so in awe of His message to me. I'm not smart enough to have this kind of answer. It could ONLY be Him that took my bold request and accusation and answered it in such a powerful and profound way. Only Him. Do you feel like you chase God? Or maybe you don't feel like He chases you? Maybe you don't feel at all like you are being pursued by Him? He cannot be chased. Because He is already chasing you. "Be still and know that I am God" Psalm 46:10. We will find Him when we stop the chase. We will find Him when we "be still"--present tense. **Follow along with us in our reading plan. You can find it here.